Bookmans Speedway is crazy for Kitty — Hello Kitty! 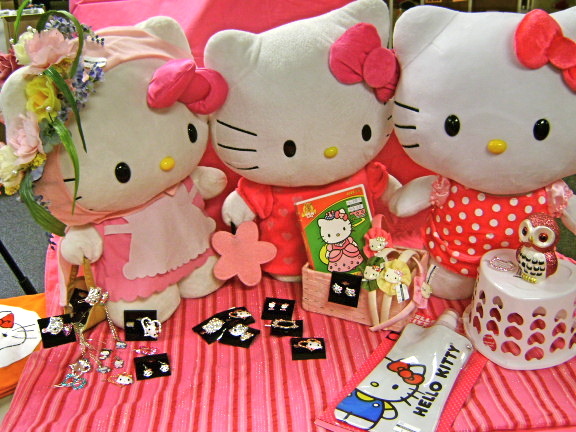 We recently picked up a selection of super cute, sparkly and PINK Hello Kitty merchandise. For the girly girl in all of us, indulge in an array of rhinestone barrettes, sweet kitty face earrings, kitty profile pins and Kitty necklaces featuring our favorite feline engaged in her favorite activities. Kitty skates, paints, wears her tutu, shops and plays guitar. She is Grunge Kitty, Rainbow Kitty, star, cupid, fairy, flower and (my favorite) Bunny Kitty! Kitty loves all cultures; her sweet heart is part of her charm. She is Peace Kitty, Girl Power Kitty, Kimono Kitty and Tie Dye Kitty. Kitty also loves color and even though pink is her signature color, we have her in yellow, blue, green and Bookmans Orange! You can take Kitty everywhere with you on your Hello Kitty bag, water bottle, watch, iPod case or key chain. Watch her in her own movies and TV shows. Check out Kitty tights and head bands, learn to draw Kitty or write your own story in a Kitty journal. There is a Hello Kitty for everyone and every mood. Embrace the Kitty in you today with Hello Kitty gear from Bookmans Speedway ’cause Kitty is Kool!